Daniel Tudor is a British journalist with degrees at Oxford University and Manchester University. He lived in Seoul for almost a decade and was former correspondent for The Economist as well as journalist for the Newsweek Korea. During his time in Seoul he made many experiences with the life as expat in Korea and published in 2012 this book about the miracle of South-Korea. In 2015 he also published a book about North-Korea called “North Korea Confidential: Private Markets, Fashion Trends, Prison Camps, Dissenters and Defectors”. Now he is living in London and is Co-Founder of Byline.com, a crowdfunding financed journalism platform. To learn more about the history and the culture in South Korea, I was looking for a book that combines both. Before I got the confirmation for my semester abroad in Seoul, I did not have much knowledge about Korea. This is why I decided to look for a nonfiction book. Furthermore I really wanted to learn more about the habits of Koreans and that is why it was important for me that the author was living in South-Korea for a longer time. “Korea- The Impossible Country” had really good critics in the internet, so I decided to order it. 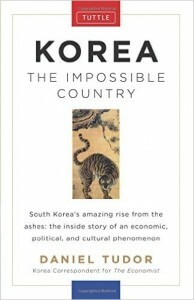 Korea: The Impossible Country consists of twenty-eight chapters that are largely independent, mostly tackling one feature of Korean culture, society, politics or economics. There is some historical background, but the focus is on contemporary South Korea and its recent history. The chapters are based on first-hand observation, interviews, and research. In the beginning Tudor offers a brief history of Korea down to the end of the civil war which is followed by the first part of the book which is called “FOUNDATIONS”, which is an overview of its core religious strands, with chapters on Shamanism, Buddhism, Confucianism and Christianity. Shamanism is also called Musok and is the belief in nature with the aim of a connection between natural spirits and human beings. It seems to be removed from society today, but it is still woven in the fabric of Koreans. Its main characteristics for today’s society are flexibility, pragmatism, openness to doubt and the acceptance of other beliefs. It also has parallels to Buddhism which was brought to Korea from Japan and still today 23% of Korea’s population are Buddhists (29,2% are Christians and 40% do not have a religious face). Buddhism has still a huge influence in Korea as it stands for desire, aversion, delusion, bad karma, rebirth and suffering, as well as a strong feeling for community. Tudor explains this feeling for community with Korean friendship which can encompass an extraordinary level because Koreans feel obligated to extend a helping hand even without a close relationship. Furthermore Buddhism effects businesses and the improvement of the country because Koreans take strong importance on group efforts and progress of the company. The choice of method that Koreans usually take to effect their improvement and the relentless pursuit of education are strongly influenced by Confucianism. It says that education is the only true resource of a country, therefore already children get excessive pressure by parents and teachers. Also the very respectful relationship to elders and the importance of family is influenced by this. Next to these three religions, South Korea is now the most Christian country in Asia. As the Koreans have a hard history, many Koreans are Christians now because it is the only religion that offers salvation. Most of them go to church weekly because it gives them also a sense of involvement, and since South Korea has one of the world’s highest internet usage, it is also possible to attend churches virtually. Part 1 of the book continuous with the capitalism and the system of businesses in Korea: The most successful firms are, so called, Chaebols (like Samsung or Hyundai) which are business conglomerates and family controlled. Since they also get political support, they have an overwhelming success. This is why every university student wants to end up in such a firm. In the last chapter of the first part, Tudor describes the miracle of the political transformation of South Korea: the graduation from dictatorship the one of the most democratic countries in the world. The second Part of the book is about cultural codes and the explanation of the words Jeong which expresses the instant feeling of warmth, belonging or even frustration (like an invisible hug) and Woori which means We. Since Jeong demands loyalty between those who share it, and also forgiveness, also hateful Jeong is possible. The word for We is one of the most important words for society. These expressions are both symbols for the collectivism which can be found everywhere in Korea: During dinner it is for example common to share food. In the next Chapter Tudor describes the high level of competiveness in South-Korea which is not only seen at school or in businesses, also women compete in appearance: 50% of Koreans Women in their twenties have had some form of cosmetic surgery. The lack of competition is indeed the lack of childhood and long working hours which often effect depression. Another cultural code is the Chemyon or not loosing face: the perception of others that one did not meet expectations was ground for deep shame. For the Koreans it is important to “not stand out, but to fit in” society. They follow an image of perfection which is on the one hand made through education, but also status symbols are important. This has also a bad side because many people end up in suicide because they cannot meet the expectations of society. The gap between the public image and private reality is huge. In the following of Part 2 Tudor explains more about the family life in South-Korea and the immense capacity of change: society is driven by the perceived need for economic and technological process. Koreans change their smart phones quickly and are early adopters for almost any technological gadget. But not only technology is changing quickly, also popular food, slang words and the popularity of politicians are affected by the Korean capacity of change. Part 3 of Tudor’s book is about the “Cold Reality”, the relation to North-Korea, the way of doing business and the real way of living in South-Korea. The opinions of a reunification of the North and South are very different. Older people are more likely to be pro-reunification, whereas younger people see it as necessary, but they would still support North-Korea in sport matches. In Tudor’s eyes, the desire for reunification will diminish even more as the years go by. In businesses long part relationships are even more important than the business itself, the feeling of community is also here very strong. People do not trust foreigners in businesses. To strength relationships in business, alcohol is very important in South Korea. The hardest challenge in South-Korea is according to Tudor finding the right person to marry. Family pressure, the shocking cost of raising a children and the tough job market makes it very difficult. More and more people graduate and are striving for a good job – this makes many delayed marriages. Before women were only seen as housewives, this is also one major change in South-Korea nowadays. In Part 4 of the book Tudor talks about “the hours not spent working”: Living conditions, dishes, free-time spending. As already mentioned before people share food and therefore there are always multiple dishes on the table. Koreans often have to defend dog meat, this is a topic they do not like to talk about. Tudor also mentions K-Pop which offers nowadays not much variety in the music industry in South-Korea anymore. Alcohol is not only popular during business meetings at night, young people also like to go out in groups to drink and to end up in a noraebang which is a karaoke bar. In South-Korea is additionally a high culture of coffee shops where people go to meet others which again shows the high feeling of community. The last chapter of the book deals with topics like Nationalism, Multiculturalism and the next steps for Korea. In South-Korea was always a high feeling of Nationalism, but nowadays Korean people are also more open to foreigners. There are many more mixed-nationality marriages and increased immigration. Young people include foreigners in “us” rather than “them”. Tudor sees this as an advantage because of provides solution for a serious problem: the nation’s drastically low birth rate. Korean wave started in 1990s with Korean movies, TV series and pop music which all found great popularity all over the world. In the past Korea always was overlapped by Japan or China, now Korea has the possibility to influence other countries. For Tudor, Korea is a modern miracle of nation building, democracy and economic growth due to its world leader position in manufacturer in e.g. ships, automobiles, cell phones and online games. 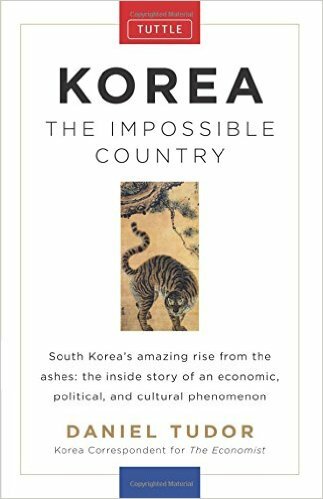 Korea: The Impossible Country is an easy read, with its independent chapters, but offers a wealth of information about contemporary Korea. The perspective seems quite balanced, presenting the unusual features of Korean society and culture and history without either stigmatizing or glorifying them. It provides a highly informative and illuminating look at not only South Korea’s history, and the foundation of its remarkable transformation, but also gives an in-depth cultural context for today’s Korean society. From the uneasy relationship with North Korea to young Koreans’ pursuit of physical perfection to the evolving role of women in a society Tudor emphasizes the advantages but also the negative sides the change brought with. It will be useful for anyone visiting South Korea or simply curious about the country; it also makes a good complement to more formal reading in history or economics. Korea: The Impossible Country is a well-researched and authoritative window into a country and its people, a society at once fascinating and perplexing to outsiders.